The iPhone 6 (Plus) with nice featured “Bigger than bigger” come to light, It’s by a huge distance the biggest iPhone so far, I belive iPhone 6 (Plus) are huges suprise for Apple fans. So, what is the first thing you want to know after you get your new iPhone 6 (Plus)? Looking to play lossless FLAC files on your new iPhone 6 (Plus)? But Apple devices cannot play FLAC as such how to get lossless and high-res audio on iOS devices? Continue reading this article you will get a variety of solutions. 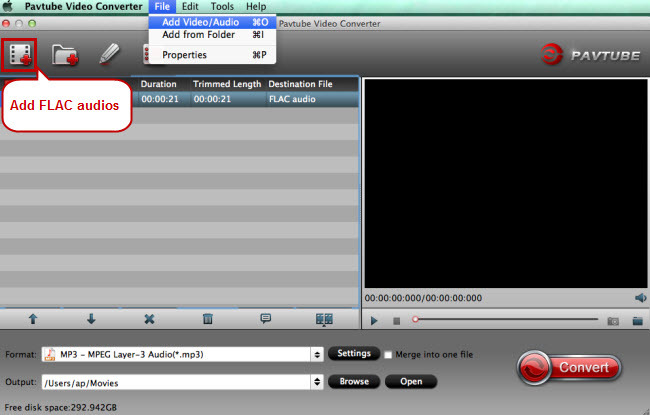 How much do you know about FLAC Codec? FLAC is a codec which allows digital audio to be losslessly compressed such that file size is reduced without any information being lost. Digital audio compressed by FLAC’s algorithm can typically be reduced to 50–60% of its original size, and decompressed into an identical copy of the original audio data. FLAC is a lossless format, meaning that FLAC files retain all the audio information of a song, unlike AAC or MP3, which remove some to compress songs to a smaller filesize. But FLAC isn’t usually compatible with iTunes, which leaves audiophiles who prefer iTunes and iOS devices in a bind: do they sacrifice audio quality or the tools they prefer? Luckily, the choice isn’t quite so dire. Even though the iPhone 6(Plus) don’t support FLAC by default, Here, we will show you the best Pavtube FLAC Converter for Mac that can play FLAC Audio files on your new iPhone. How to transfer lossless FLAC audio to iPhone 6 & iPhone 6 Plus on Mac? Step 1. 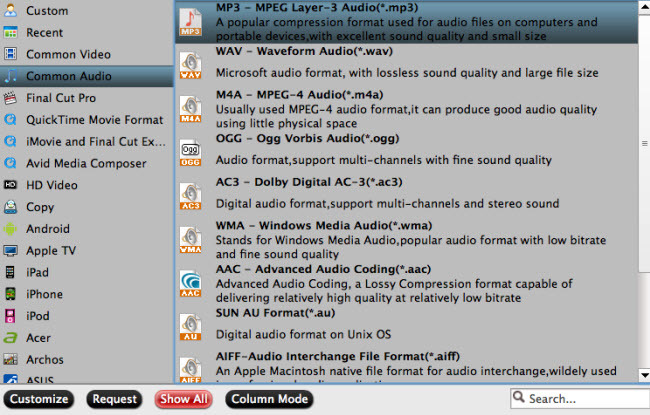 Import FLAC audio files. Launch the FLAC to iPhone 6 converter on Mac, and click “File” ＞ “Add Video/Audio” or the add video icon to import lossless FLAC audios. Move your cursor to format and choose “Common Audio” and you’ll see a list of audio formats, choose one from them according to iPhone 6 (Plus) supported audio formats which have been listed in the above text. Step 3. Adjust audio specs (optional). Step 4. Convert loss FLAC to iPhone 6 (Plus). Start FLAC to iPhone 6 (Plus) conversion by clicking on the “Convert” button, and you’ll get the converted FLAC audio in format soon. 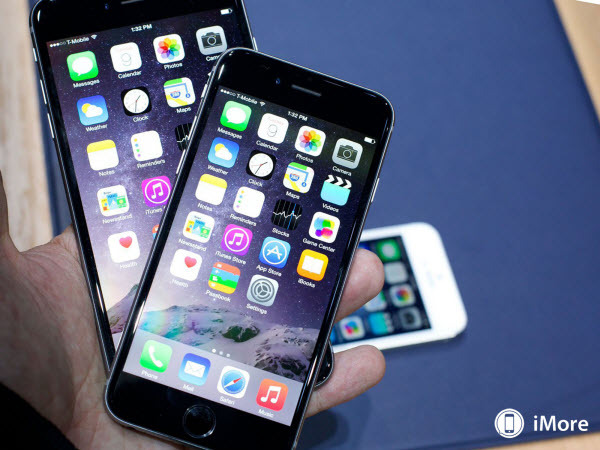 Then, you need to transfer the converted files to your iPhone 6 Plus and iPhone 6. 2. Youtube Videos cannot be playback on iPhone 6/iPhone 6 plus with Original Quality? 3. Watching high definition videos is good idea for iPhone 6/iPhone 6 plus. However, just the same as other smart phones, videos in the format like MKV/AVI/Tivo/VOB/MPG/WMV/FLV cannot be imported and transferred to iOS devices like iPhone, iPad and iPod Touch, including the releasing iPhone 6. How to solve this problems? Read here.